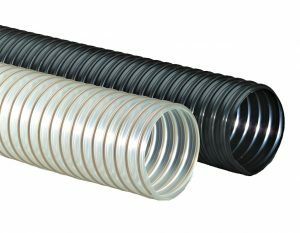 Urethane duct hose for lawn & leaf vacuum and blowing equipment is light weight and tear resistant. 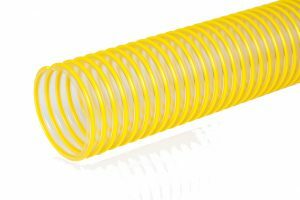 Our standard product range includes polyurethane duct hose in a variety of grades with a poly helix (shown below in yellow) or a spring-wire helix. A poly helix allows for an extremely smooth interior for improved flow and less drag resistance, while a spring-wire helix offers maximum flexibility. Urethane is a thin hose material that is highly puncture and abrasion resistant, very light in weight, and clear for easy site of flow. A solid black version is available as well in most sizes. Additional styles include heavy wall thermoplastic for commercial truck loaders, and PVC for light duty service (See Clear PVC Duct Hose). Most hoses can be custom ordered with 2″ long soft cuff ends and can also be manufactured in special lengths.